Three days later found me at ‘Camp Mud’, on a silt beach along the Kongakut, some experiences richer. I was beginning to feel the rhytm I was reaching for. This was the first night I was not exhausted. 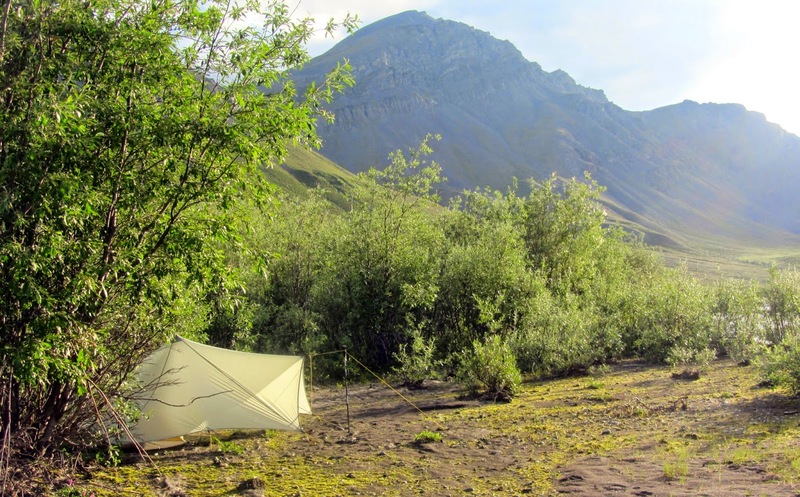 The two previous nights I had slept better than any night I have ever slept in the outdoors, just completely knockered. Also, the food was now beginning to taste good, not only something you shoveled down because you had to. The second day out I had hurt my right ankle, a slight sprain, that was now beginning to be less and less of a problem. That day, my first whole day on the trail, had started out with some fairly easy gravel bar hiking. 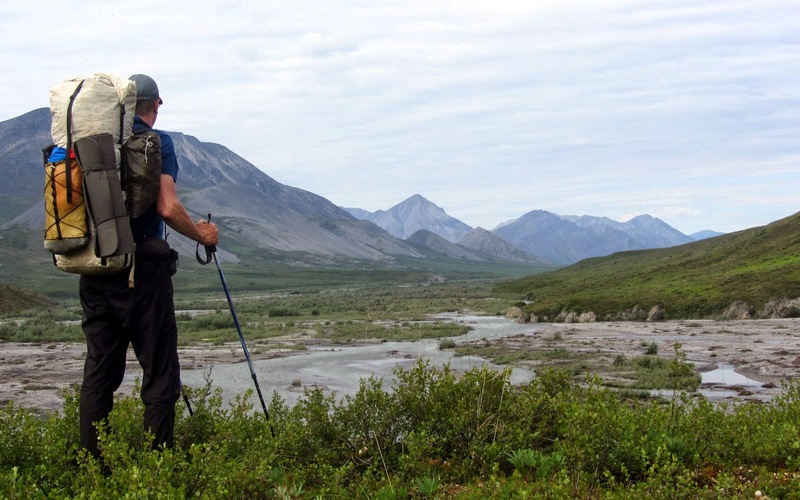 Using hiking poles for balance, hiking on the fist-sized rocks that are most common, is easier than you might think. Without walking poles, not so easy. Still, I had missed a step and twisted my ankle a bit. Another learning experience was that instead of avoiding the willow thickets that grew in the creek bottoms, I should seek them out. That was where I would find the best travel, simply because they usually housed a number of nice, well-trodden game trails. Being a friend of all animals I cheerfully called out: ”Hello, hello” every 50 meters of thicket or so, in order not to scare any bears. One of my hiking poles lost its point in the gravel bars, not so good with a month of hiking ahead. I carried spare points, but a small rock had lodged in the hole were the point should have been threaded. Using a corkscrew on my Swiss Army knife I managed to dislodge this rock. First time I have had any use for that cork screw. I was beginning to develop the right feeling for how the terrain and the 250 K maps connected. Once I thought I had reached the Kongakut, but it turned out to be a tributary. Navigating by dead reckoning was essential. I took careful notes of the times when I took my hourly breaks, and marked that and dead certain positions on my map. The weather had been warm or hot and the mosquitoes were obviously enjoying this. 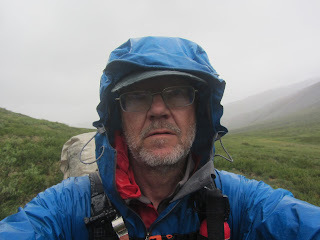 Hiking in my thin Patagonia running pants and the Icebreaker merino short sleeve, I was mostly soaked with sweat. At breaks I took of my shoes and thin nylon socks and draped the rain jacket over my feet, to protect them from the little blood suckers. There had been wonderful moments. At lunchtime after my second night I passed a divine little valley with spectacular limestone cliffs. The sun was shining, there were (for some obscure reason) not a mosquito in sight. I took my time over lunch on a gravel bar, washing myself in the chilly creek and basking naked on my foam pad in the sun. I named my stop by this nameless creek Paradise Valley. In fact I had started to, in order to relate to and remember places and also to help me in navigating, put my own name on things. 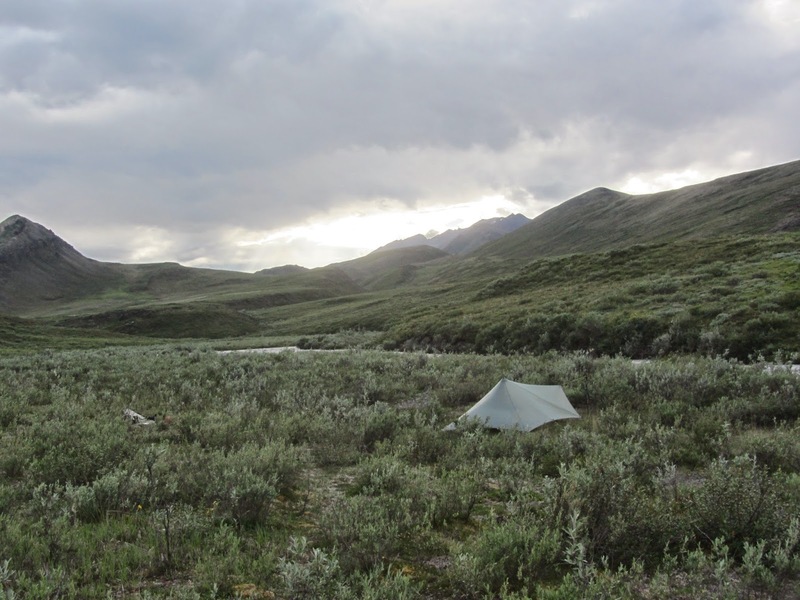 For instance I gave a name to each night camp since there were no names of creeks or mountains to use and I realized that just putting numbers to them or using the date would not be enough for me to remember them clearly and tell one from the other. Following this tributary towards the Kongakut River I ran into the exact opposite of paradise. A spectacular mountain, with a steeply soaring slope reaching some 1000 meters above the valley floor, was on my right. A much more reasonable hill on my left promised a shortcut to the Kongakut. 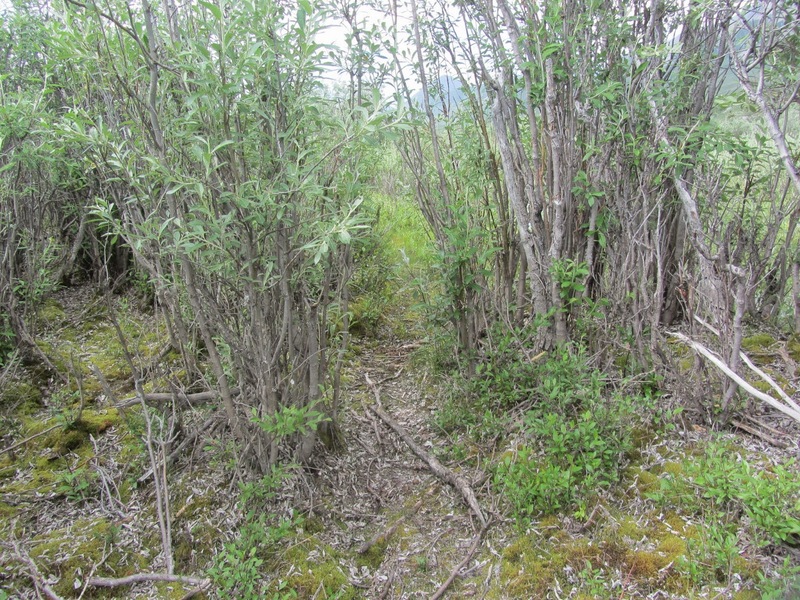 However, even if it was a comparatively a dwarf it would demand a climb up from the easily travelled creek bottom onto tussock country, as far as I could see. I choose to stay with the creek. This turned out to be a bad move. And foreboding what was to come, in spades, further down the line. The steep giant to my right, it turned out, had dumped a huge load of it’s steep incline into creek, an avalanche of rocks with sizes varying between that of cars and tenement buildings. The easily travelled gravel bars were suddenly annihilated by a maze of huge boulders through which an increasingly narrower and white water foaming creek tortuously made its way. So, no banks left, and a malstroem of a creek to follow. The only choice was trying to find slopes and boulders in and around and through this maze that were climbable with a heavy pack and poles. I had some hairy moments in the hot sun before exiting on the other side of this giant, kilometer-wide rockslide. 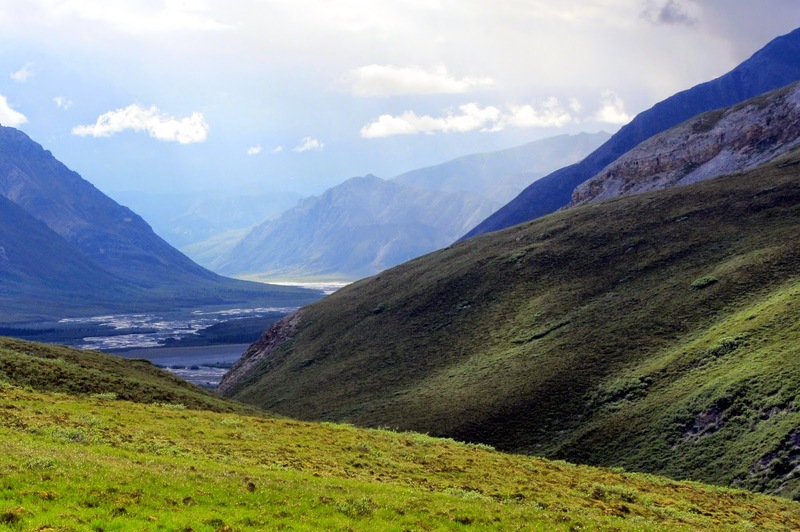 The parts of the Kongakut River that I first encountered turned out to be spectacular. A wide valley with a river bed consisting of 90 percent gravel bars, only 10 percent being water at this time of the year. This water flowed, braided, through a number of channels. Watching over this were peaks that well matched the one that had hatched the rockslide guarding the way to Paradise. It all reminded me of one of the most the spectacular areas in the Swedish mountains, that around Rapaselet in Sarek National Park. Only there was more of it here. More mountains and a longer stretch of beautiful river. Life does not get much better for me than walking on sunshine along a wilderness river like this. Later, after having passed what could almost be called a ’gate’, the surrounding limestone behemoths eased off and melted into more of rolling hill-like mountains. 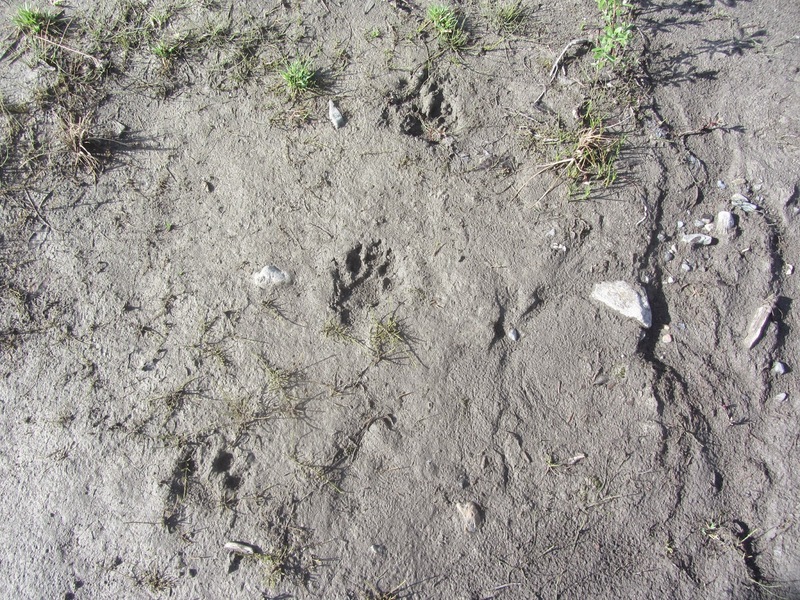 I ran across my first wolf-tracks in the sand along the river here, and shortly after not only the tracks of a grizzly, but also the unmistakable imprint of Homo Vibramus. These hiking boot tracks I would encounter a couple more times during the next few days, showing that somebody recently had more or less chosen the same path along the Kongakut as I had. I never saw this hiker or hikers. Apart from these footprints there were no traces of man. No litter, no blackened fire rings, no rings of rocks signaling that there had been tent pegs weighted down. It was like walking through a dream of the original wilderness. The way I have always wanted it. The Kongakut, meandering through this rocky and hilly landscape, established a pattern of travel that I would use along rivers for the whole walk. On the outer curves of the river bed the river usually carves more or less steep rockfaces, that could be anything from one meter to 500 meters high. At this outside of the bend in the river the current was at its fastest and deepest, and thus the worst place to ford. Along the inside of the bends the water was running less deep, less fast and the banks were also less severe or non existent. At low water like this they petered out into gravel bars that could range for hundred of meters before the actual river banks took over. 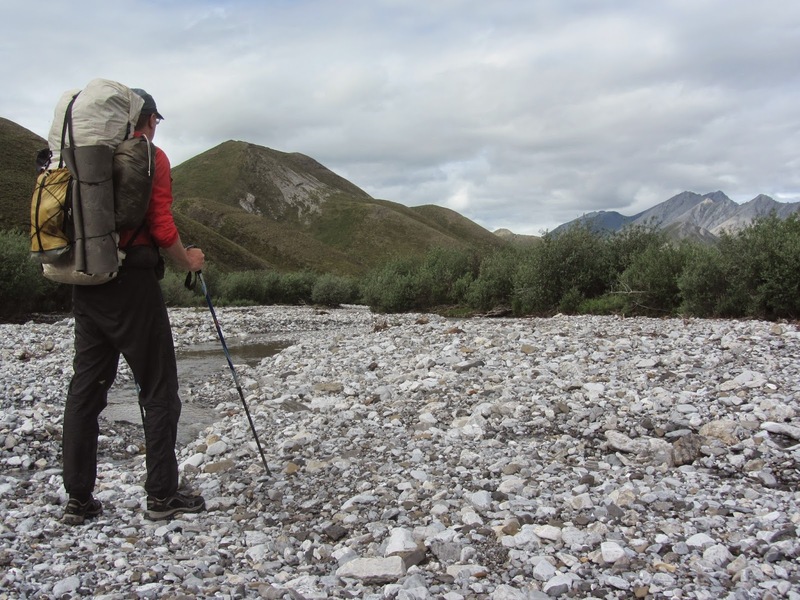 So walking upstream in a river bed like this meant that you usually crossed the river somewhere between two bends all the time, switching from one gravel bar to another, avoiding the steep sides. The river being braided, this meant numerous fords for each crossing of the river bed. 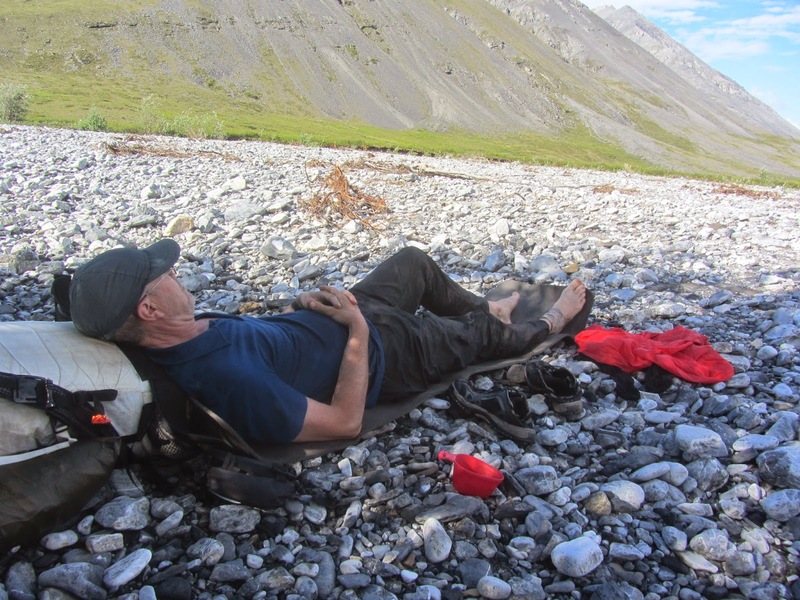 So I forded 20-30 times every day along the Kongakut, and for much of my hike along the rivers through the ANWR. Only a couple of the fords along the Kongakut were what I called ’80-percenters’. That is, I figured they had taxed my fording skills to about 80 percent of my perceived capacity. This left reasonable margins so far, even if my capacity probably only is 90 percent of what I perceive it to be. Hiking through country like this, you can only dream of keeping your feet dry. Even with rubber boots I would sooner or later have stepped into something too deep. 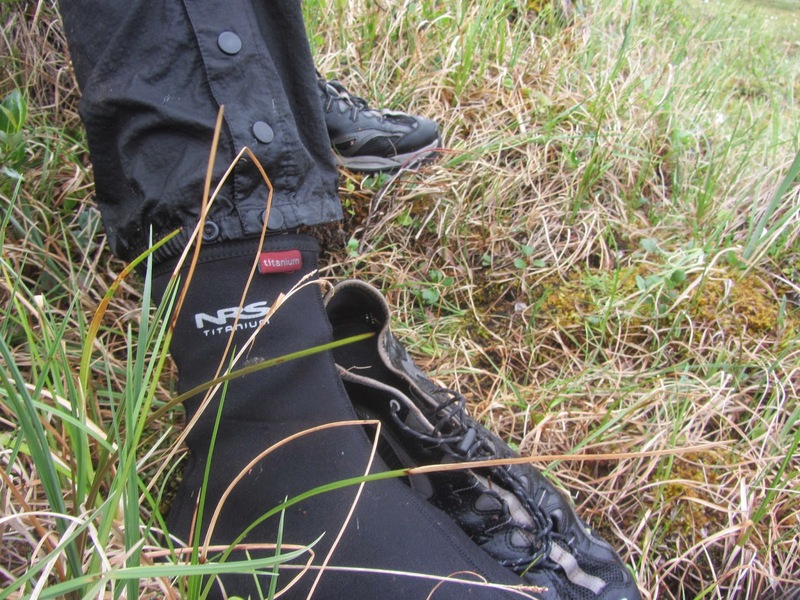 I knew this, and my chosen footwear for the soggy Scandinavian mountains turned out to be ideal also in Brooks Range. I wore really thin nylon socks, 60 denier, and Salomon Tech Amphib mesh shoes. My pants were thin nylon Patagonia Houdinis, weighing only 100 grams, but wind-proof and mosquito proof. After a knee deep ford it took less than 10 minutes for these pants to become dry, a couple of centimeters at the bottom of each leg excluded. The shoes and socks drained quickly but were of course more or less permanently damp. However, this was a well-ventilated dampness that kept my feet in excellent shape. Something that compared favorably to the sickly and oxygen deprived hothouse dampness of wet, membraned hiking boots, something that really tends to soften the skin of the feet bigtime. Later in the trip, when weather and water got colder I often wore neoprene socks, which kept the cold at bay. When this was not enough, in snow and constant rain, I donned pile socks for insulation and a pair of Rocky Goretex socks for waterproofing. This was always enough to keep my feet pleasantly warm and dry no matter the circumstances. 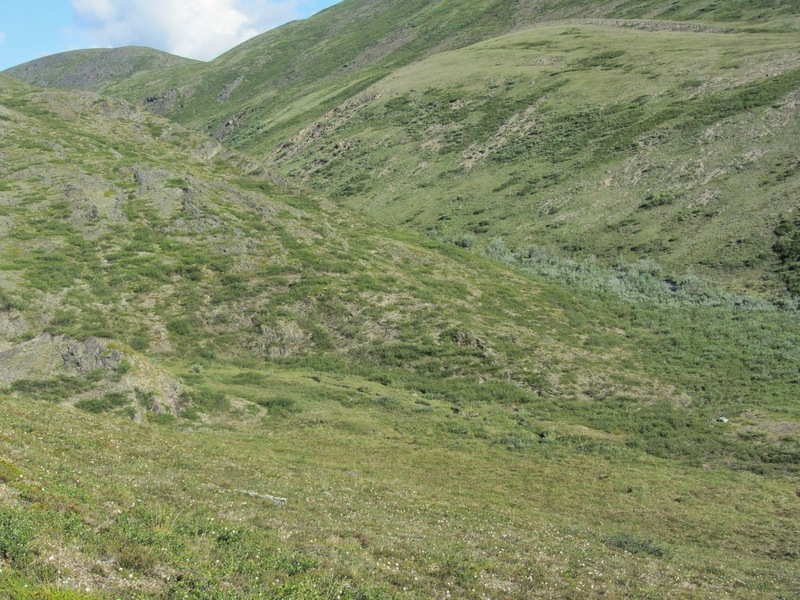 During this entire hike along the spine of Brooks Range I did not develop even the tiniest tendency towards blisters or cracks in the skin of my feet. After a couple of days, however, I felt it would be nice with some support under the arches, so I took a pair of Smartfeet Carbons, the lightest innersoles they have, from my pack and used them in my shoes for the rest of my walk. Basking in the sunshine this evening, on the silt beach of the Kongakut, there was not much to complain about. I had some pain in my left calf, some muscle tissue having been ruptured or pulled. Not pleasant, but not slowing me down. I suspected it would go away in a day or two. Also, the piezo igniter for my Primus Eta Lite stove had lost its spark. Piezo igniters are comfortable, but not very reliable in my experience. This one was a new replacement of one that had broken during Coast2Coast Sweden only a month before. So I always carry plenty of back up ignition for my stove. 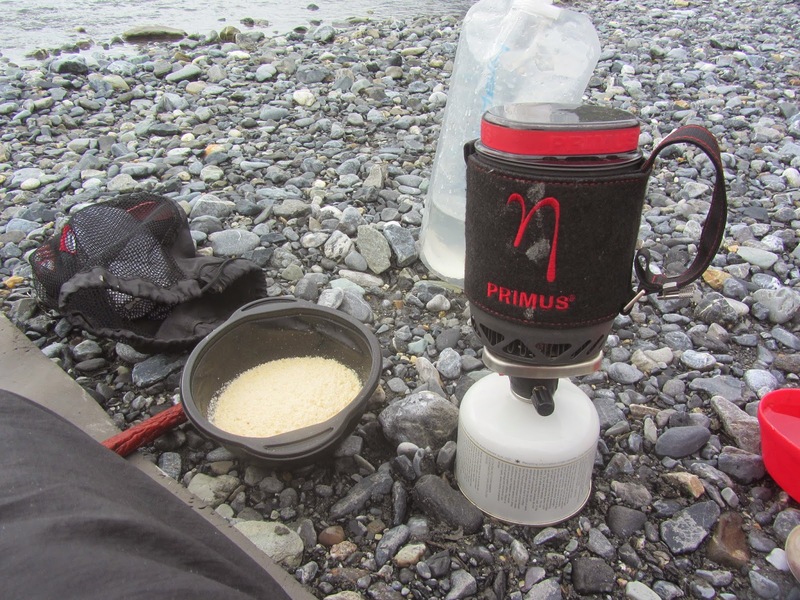 In fact, on this trip I carried a backup stove for the first time in the shape of my trusty old Primus Micron, weighing only a 100 grams. The following days the Kongakut got smaller and smaller. My pace had increased, I did a couple of 18 and 21 kilometer days. Not impressive compared to Andrew Skurka who averaged twice that through the Brooks, but pretty good for and elderly fellow, from Sweden to booth. I was getting tuned into this particular terrain. And having the time of my life. I had been snap-shooting with my Canon compact camera, but now figured it was time start using the GoPro and making some film. What I found was that inspite having brought three fully loaded batteries from Fairbanks, all three were now dead as doornails and not nearly as useful. Also, my Neoair inflatable sleeping pad had somehow begun to give me that sinking feeling. 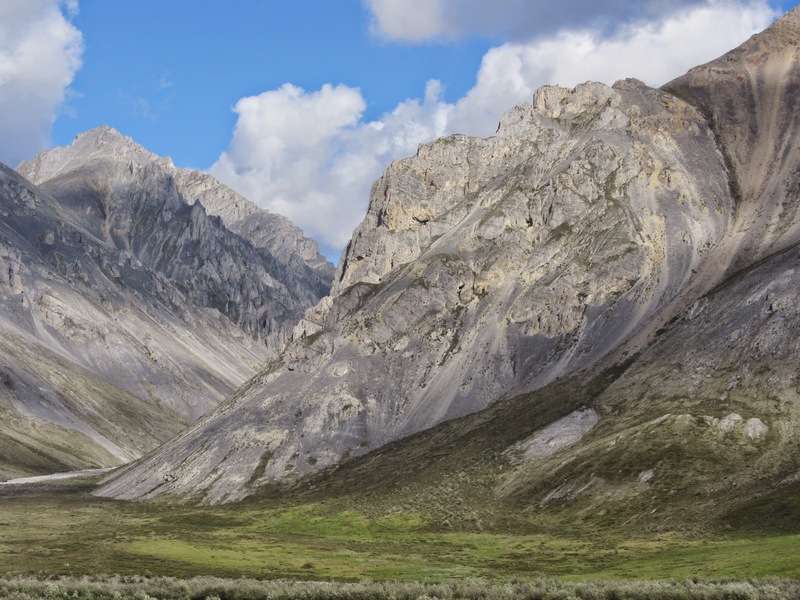 From my Nahanni trip a couple of years ago I sort of suspected that it would also be impossible to find the hole in the field and tape it or glue it. This turned out to be correct, so once every middle-of- the-night I had to inflate the damned thing. The weather was still warm, even hot. Some nights it took until 2-3 o’clock before it was cool enough to crawl into the sleeping bag. Signs of change in this weather system showed on my last night by the Kongakut. This was the best place to pitch my tent I had found so far, among some low willows a bit higher and away from the river. I relaxed, sitting on my pad by the rushing river, at this place running in one knee-deep channel some 15 meters across. Around me the expanse of low hills gave way to distant more pinnacled mountains in the distance. On the horizon to the west there was even a glacier shimmering between some high and pointy guardian turrets. Camp Moor seemed a fitting name to this home for the night. The following morning I misjudged my position slightly and started up the wrong arm of the river towards its source. The source being a small lake in a tussocky bowl not far from the next river on my agenda; the Sheenjek. No big deal, I soon discovered my mistake, which forced me over a not too un-pleasantly steep ridge with great views. It was sunny and pleasantly warm and the whole expanse felt a bit like a dry version of Scotland. I recovered my self-esteem as a navigator when I managed to avoid picking another wrong arm and stayed with the river I had come to like so much, the Kongakut, to it’s birthplace. Now the river was down to something I could jump across. It rained a bit when I passed the little lake where it all originated. It is positioned right on top of the continental watershed. 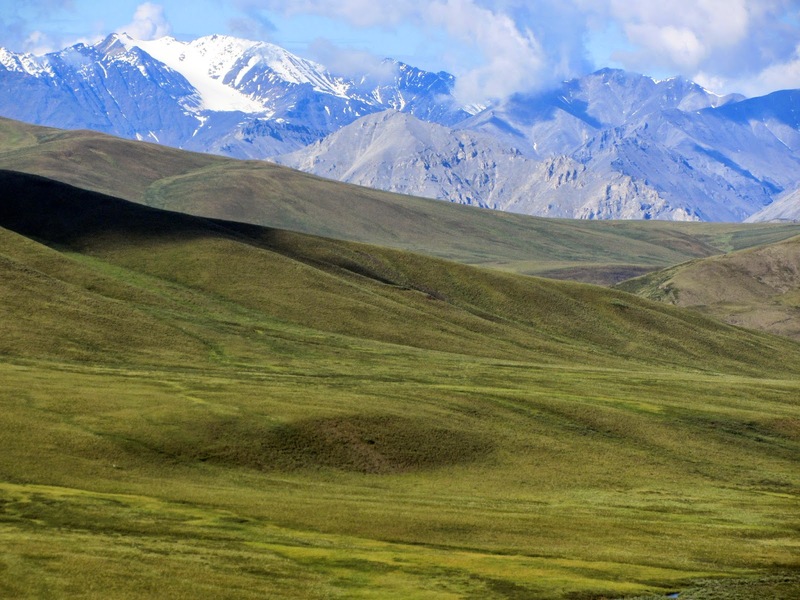 The Kongakut runs to the Arctic Ocean, the Sheenjek empties in the Pacific. Travelling up over a long slope while the rain petered out, I was now in the Sheenjek River watershed and could see the mountain citadell I knew was waiting on the far bank. I felt a bit worried while descending towards the Sheenjek that glittered in the distance. I soon found a sizable ravine that took me in the right direction. The reason for my worries was that the Kongakut was now a known entity, a pleasant encounter, not too challenging, that had eased me into my hike, helped me find my rhytm. Maybe this would be the end of the honeymoon. The Sheenjek was not a known entity. The Garmin map had shown a valley that was more of a lake in this area. How wide and fordable, or unfordable would it be? I could not count on every river being the benevolent, braided bunch of creeks that the Kongakut mostly had been. If I encountered a river several kilometers wide and flowing fast, I would likely not be able to cross here. In that case I would have to follow the river upstream for as long as it would take to find a safe ford. If I managed that I had made some alternate plans for crossing the jumble of high peaks blocking my way west over a high pass. Now, high passes was also something that worried me. 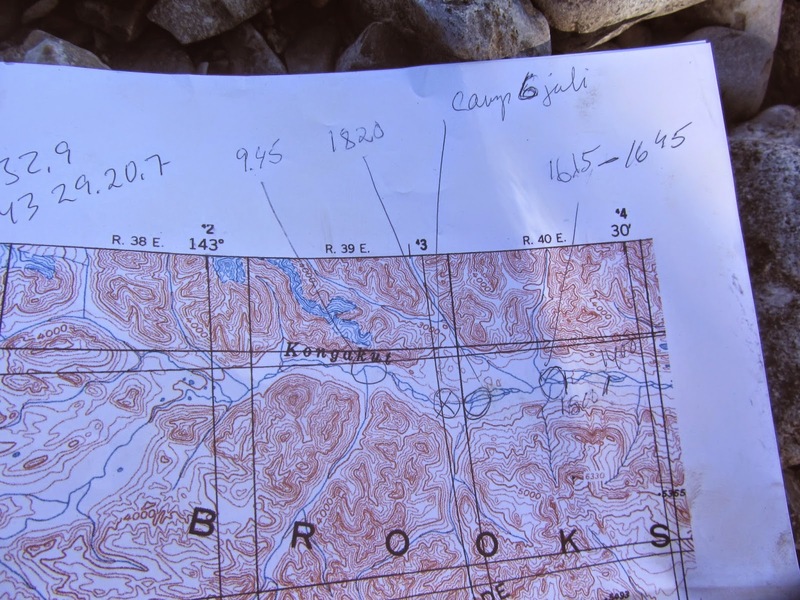 If you are not familiar with the terrain it is difficult to grasp exactly how steep and difficult a pass shown on a topographic or GPS map really is. A lot also depends on the footing if a steep pass is passable or not. I had seen from Buck Nelsons film Alone Across Alaska that he had climbed some seriously steep slopes. My next river, beyond the Sheenjek, was to be the East Fork of the Chandalar and the easiest access would be, not to cross the jumble of glaciated peaks, but to go around the southern end of Double Mountain, one of the few mountains with a name that I encountered, and then north-west, along a nameless tributary to the East Fork. This passage into the next watershed seemed an easy route, similar to the one I was just travelling from the Kongakut to the Sheenjek. Much depended on the Sheenjek. Would it be fordable where I first encountered it or not. What I glimpsed in the distance looked big, but I could not see how braided it was nor to what extent it filled its river bed. Also, I find it difficult to really judge the depth and speed of a river until I actually get my feet wet and can feel the current against my legs. I had a hunch that, once down by the Sheenjek, it would be a good idea to have a cup of coffee and think things over. Great trip and report! Give us more. Thanks Bill and Roger, much appreciate your kind words. 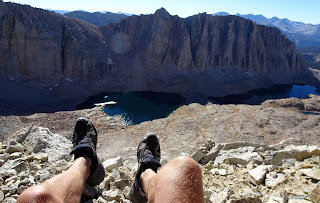 By and by, as I check my notes and maps and write about my hike I begin the realize what an experience it was. At the time it was a bit more of "all in a days work" even if I certainly had time and presence of mind to marvel at beautiful views and the whole expanse if that great land.